Doctors Reconsider Treatments with Painkillers Pfizer has agreed to suspend sales of its painkiller Bextra, after U.S. and European regulators said the risk of serious side effects outweighed the benefits. Now, doctors must find alternative treatment for their patients. Michele Norris talks with Dr. Joshua Prager of the California Pain Medicine Center at UCLA. The Food and Drug Administration on Thursday announced that dozens of popular prescription painkillers must now carry the government's strongest warning about the risks of serious heart attacks and strokes. Makers of over-the-counter nonsteroidal anti-inflammatory drugs, or NSAIDs -- a category of drugs that includes Aleve, Advil and Motrin -- have also been ordered to add strong warnings to the drugs' packaging to take only low doses for a few days at a time to avoid the risks of high-dose, long-term use. One drug, Pfizer's blockbuster painkiller Bextra, was ordered off the market -- the FDA said the risk it posed of serious side effects, including a potentially fatal skin reaction, outweighed the benefits. The new FDA warnings don't apply to aspirin, which the agency says has "clearly been shown" to reduce the risk of serious cardiovascular problems in certain patients. Now, doctors must find alternative treatment for their patients. Michele Norris talks with Dr. Joshua Prager of the California Pain Medicine Center at UCLA. Bextra: Data suggesting short-term heart risks associated with the use of Bextra, lack of data on the safety of long-term use, and reports of serious, potentially life-threatening skin infections prompted the FDA to ask the company to pull this drug from the market. 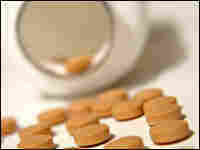 Celebrex: The FDA says doctors should prescribe the lowest effective dose for the shortest amount of time possible. The FDA has asked Pfizer, the drug's maker, to revise Celebrex's packaging to include a "black box" warning -- the strongest possible -- on the heart and gastrointestinal risks associated with NSAIDs in general and Celebrex in particular. The FDA also wants Pfizer to commit to a long-term study comparing the safety of Celebrex to that of naproxen and other drugs. Patients taking Celebrex are urged to discuss the FDA's new advisory with their doctors. Prescription and Over-the-Counter Non-Selective NSAIDs: Long-term, controlled clinical trials have not been conducted for most NSAIDs on the market, a large category of drugs that includes such well-known brand names as Aleve, Motrin and Advil, as well as products containing diclofenac. All makers of these drugs will be asked to review and analyze existing data from controlled clinical trials and conduct long-term trials. Prescription NSAIDs will now carry a black-box warning on the potentially serious heart and gastrointestinal risks they pose, as well as a contraindication for use in patients who've recently undergone coronary artery bypass surgery. Patients taking prescription non-selective NSAIDs are urged to talk to their doctors about the new information regarding these drugs. In the health advisory it issued Thursday, the FDA said using over-the-counter NSAIDS for short periods of time and at low doses likely doesn't increase cardiovascular risks. Still, it has ordered revisions to labels on these over-the-counter NSAIDs to include stronger reminders about limiting the dose and duration of treatment, and a warning that people taking the drugs are at an increased risk for heart attacks, stroke, gastrointestinal bleeding and serious skin reactions.